Because of my Canadian heritage, one of the genealogy newsletters I subscribe to via email is from Global Genealogy. Besides news and research articles pertaining to Canadian genealogy, Global Genealogy is also a great resource of books, maps, and software. In their last newsletter, I noticed that their book and CD series, Early Ontario Marriage Registers and Vital Records, 1786 - 1870, had online indexes. If you've done any Canadian research at all, you'll know that Ontario didn't start keeping vital records until 1869, with the start of mandatory civil registration. All my Canadian ancestors immigrated to Ontario before this date, making finding most vital records impossible. Prior to this date, however, many districts in the province of Upper Canada (now the southern part of Ontario) attempted to keep vital records. All non-Anglican and non-Roman Catholic ministers who performed marriages were required to provide their marriage returns to the district peace clerks, and most of these returns were recorded in the 1830s and later. Clicking on the link above gives a good historical outline and research guide for this time period. It also leads to the transcribed records in book and CD formats, which can be purchased, as well as FREE INDEXES of these records. As I started searching through these indexes for my early Ontario ancestors, I decided to come up with a spreadsheet for these resources to help me track my research. I have made this spreadsheet available to you for your own use at http://tinyurl.com/OntarioVR. If you find your ancestors listed in the indexes, I recommend you purchase the corresponding book(s) at Global Genealogy for more details on the records themselves. By the way, if you are looking for Ontario vital records after the start of civil registration in 1869, some places where they can be found are Ancestry.ca or the world membership subscription at Ancestry.com. They are also available for free at FamilySearch.org. There are also a number of early records indexes at Library and Archives Canada. 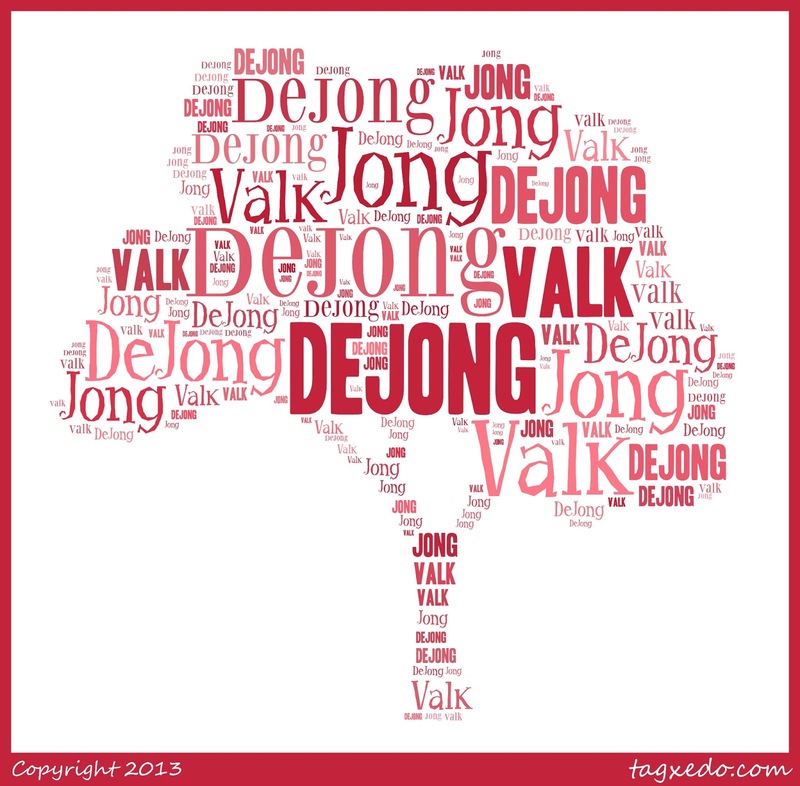 The DeJONG family is one of my Dutch lines, most likely out of the province of Friesland. The name literally means "the younger." Surnames were not common in the Netherlands until 1811, when Napoleon, who then reigned over the Netherlands, ordered the Dutch to register a surname with the civil authorities. 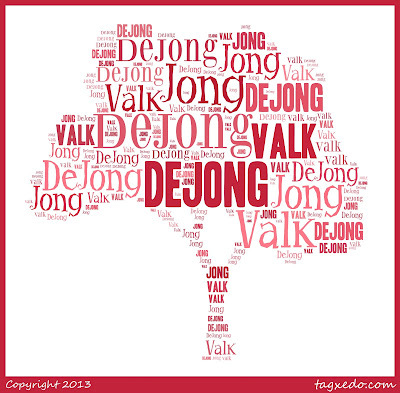 My 2nd-great-grandmother, Berber DeJONG, is really the only person with this surname that I have solid information on. Her father has been named as "Sjerd DeJONG," but I am working with the hypothesis that he may have instead been Tjeerd Thijzes de JONG, as there is no registration of a birth of a Berber DeJONG to a Sjoerd [correct spelling] DeJONG in the Netherlands that fits my ancestor. My hypothesis has been written into a research plan that can be read here. Ahnentafel #50 - Sjoerd DeJONG (dates unknown) - may be the same individual as Tjeerd Thijzes (also spelled "Thijsses") de JONG (1812 - 1862). Ahnentafel #25 - Berber "Barbara" DeJONG (1858 - 1934) - born in the Netherlands, she immigrated in 1882 to the United States with her fiance, Tjammes "James" Wiegers VALK (1860 - 1922) of Ferwerderadeel, Friesland, the Netherlands. They first settled in Rock Island, Rock Island Co., Illinois, where they immediately married. Later, they moved to Western Michigan. They had eight children; three of whom survived to adulthood. 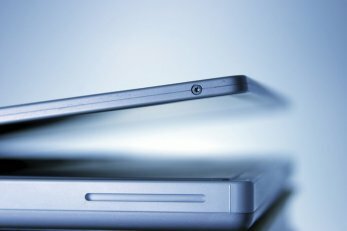 Recently, a number of digital archives websites have been inviting crowdsourcing in order to add metadata to their databases to allow ease of searching said databases. In case the previous sentence makes no sense to you, let me state it again in non-techy terms: Websites with databases full of historical digital images have been inviting volunteers to index the images, adding descriptions, comments, and tagging the digitized documents with names, dates, and places. Because these tend to be such vast projects, this crowdsourcing helps all of us by providing searchable, more usable databases attached to these digital images. We can find what we want when we can search on a name, date, or location, rather than having to browse through thousands or even millions of images. One of the most notable examples of crowdsourcing was FamilySearch's 1940 U.S. Federal Census Indexing Project. Originally projected to take seven months, the census was completely name-indexed in four months, using 150,000 volunteers. Another well-known crowdsourcing project in the genealogy world is Ancestry's World Archives Project, indexing genealogical records from around the globe. Fold3 has annotating and comments features for its databases, although these are limited to subscribers only. Additionally, some newer projects have been started for a couple of state digital archives projects. The first is Washington State Digital Archives. They have launched Scribe, a digital tool for adding metadata to their collections. A tutorial video can be viewed here. 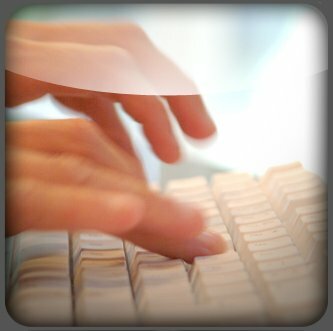 I tried Scribe out, and although I liked it, I have to admit it was not as efficient as FamilySearch's indexing tools. For example, the first document I indexed had three marriage licenses on it, yet there was only room in the Scribe tool to index one. I tried to see if there was a way to add more metadata for the other licenses on that page, without success. Also, I was unsure of what to do with initials, rather than names. Should "J. B. Smith" be indexed in the First, Middle, and Last Name fields as "J., B. Smith" or "J, B, Smith"? Some clarification and basic rules for complex situations would be beneficial. Nevertheless, I was excited to see the possibilities this has! Another site with recent meta tagging capabilities is the California Digital Newspaper Collection. By creating a free account, one can add keyword tags and leave comments on various articles in the digitized newspaper collection. Correcting text misread by OCR software is also an option. Crowdsourcing is definitely a way to give back to the genealogical and historical community. If you don't yet have a favorite volunteer project, I encourage you to pick one! Also, do you know of other similar crowdsourcing projects not mentioned? Please leave info and links in the comments below. The July 2013 Scanfest will take place here at AnceStories this coming Sunday, July 28th, from 11 AM to 2 PM, Pacific Daylight Time. 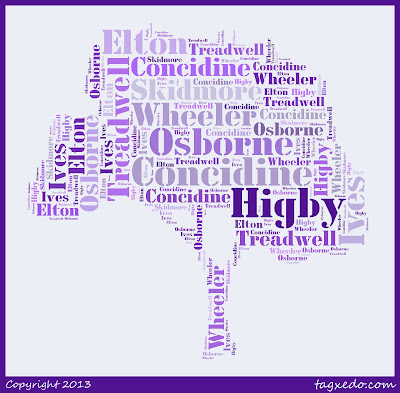 Higby is one of my paternal grandmother's adoptive lines. It is her adoptive maternal grandmother's maiden name. In doing a little digging, it appears that the Higby family was an early New England one. It is frequently seen with the Higbee spelling, and occasionally as Higbie. In England, it appears to have originally been Higbed. I use the letter "B" after each ahnentafel number to distinguish my adoptive family ahnentafel from my biological one. Ahnentafel #2944B - Edward HIGBY, the immigrant (1615/6 - 1699) - born in Ivinghoe Parish, Buckinghamshire, England, he had immigrated to North America by about 1646. He settled on Long Island, with his wife, Jedidah SKIDMORE (1624 - 1660). By 1663, he had settled in Middletown, Middlesex Co., Connecticut. He had 10 children with Jedidah; then later had six more children with his second wife, Lydia [?]. He appears to have been somewhat of controversial figure, as he is named as both defendant and plaintiff in a number of lawsuits over property as well as slander charges. He died in Jamaica, Long Island, New York. Note: I have seen a number of online genealogies tracing Edward's lineage into England, but I do not know how accurate they are. Ahnentafel #1472B - John HIGBY (1658 - 1688) - He was born in Huntington, Suffolk Co., New York and married Rebecca TREADWELL (1658 - 1708) in 1679 in Middletown, Middlesex Co., Connecticut. They had five sons. Ahnentafel #736B - Edward HIGBY (1684 - 1775) - Born in Middletown, Middlesex Co., Connecticut, he married Rebecca WHEELER (1686 - 1771) there in 1706 and had eight known children. He died in Westfield, Middlesex Co., Connecticut. Ahnentafel #368B - Isaac HIGBY (1709 - 1766) - He spent his entire life in Middletown, Middlesex Co., Connecticut. He married Dinah ELTON (1713 - bet. 1793-7) in 1730 and they had 13 known children. Ahnentafel #184B - Daniel Elton HIGBY (1739 - 1829) - Born in Middletown, Middlesex Co., Connecticut, he married Martha IVES (b. 1742) there in 1766. They had four known sons and perhaps two others. In 1758, Daniel enlisted in the 7th Connecticut Company (Captain Timothy Hierlehey's company), during the French and Indian War. He died in Lewis Co., New York after moving there with his son Benjamin. Ahnentafel #92B - Silas HIGBY (c. 1777 - c. 1855) - Not much is known about Silas, other than his birthplace of Middletown, Middlesex Co., Connecticut. His wife's name is unknown. They had 10 known children. It's not clear exactly when and where Silas died, although it likely was in New York, perhaps Constableville, Lewis County, where his first four children supposedly were born. Ahnentafel #46B - Stephen HIGBY (1810 - 1873) - He was born in Constableville, Lewis Co., New York and married Hannah "Matilda" OSBORNE in 1840 in Ohio, probably in Bedford, Cuyahoga County. They had 11 known children, eight of whom survived childhood. About 1853-4, they removed to Alleghan Co., Michigan, and then again about 1857 they settled in Byron Twp., Kent Co., Michigan, where they lived out their lives and eventually died. Ahnentafel #5 - Jane Marie YORK (a.k.a. Jeanne Marie HOLST) (1924 - 2012) - my paternal grandmother, an adoptee. She was born Jane Marie YORK, and was adopted by Alfred Henry HOLST and Nellie Mae CONCIDINE. Her name was changed at adoption. She married Robert Louis ROBBINS (1920 - 2003) in 1940. 4. 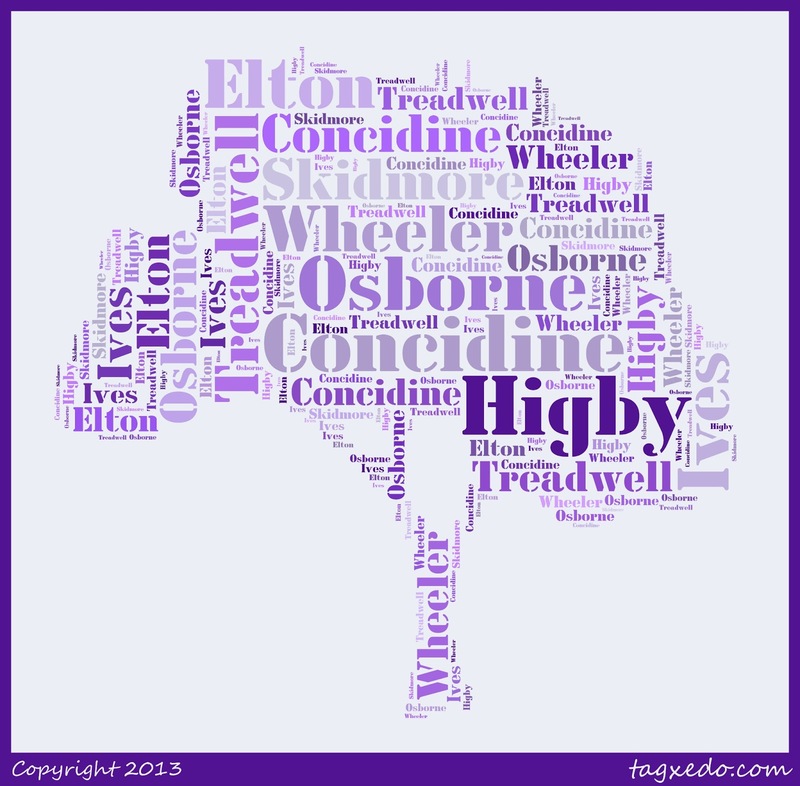 Edward Higby and His Descendants by Clinton David Higby, Ph.D., 1927. Still under copyright, available in many genealogy libraries. The FREDENBURG family was a Dutch colonial one. The emigrant ancestor supposedly was William VAN VREDENBURGH, a soldier for the Dutch West India Company. He apparently came to New Amsterdam (now New York City) in 1658. The name FREDENBURG has multiple spellings and evolutions. 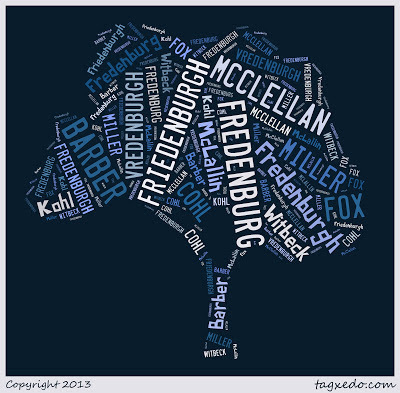 Some of them include: FREDENBURGH, FRIEDENBURG, FRIEDENBURGH, FRADENBURG, FRADENBURGH, and (VAN) VREDENBURCH. So far, I've only been able to trace my ancestry through my 4th-great-grandfather's generation, with any accuracy and sources. Information shared with me and that which I have seen online (unverified, of course), hints that my Anthony FREDENBURG is likely the great-great-grandson of immigrant Willem. Other information claims to trace back Willem's ancestry another five generations to Hugo VAN VREDENBURCH. Ahnentafel #92 - Anthony FREDENBURG (1816 - 1881) - born in Tackannae, Schoharie Co., New York; died 15 June 1881, probably in Greenwood Twp., St. Clair Co., Michigan. He married Hannah FOX (c. 1814 - c. 1890) in 1837 in Middleburg, Schoharie Co., New York. He was supposedly a son of John FREDENBURG (1789 - 1857) and Charity/Geertje MILLER (1792 - 1873). Ahnentafel #46 - Sylvester FREDENBURG (1844 - 1879) - Civil War veteran; read more about him here. Ahnentafel #23 - Mary Jane FREDENBURG (1875 - 1962) - born in Chesterfield Twp., Macomb Co., Michgan. Married four times; her first marriage was to my ancestor, Orlando BARBER (1868 - 1910). She died in Lapeer, Lapeer Co., Michigan (obituary). Ahnentafel #11 - Mary Jane BARBER (1909 - 1975) - read her AnceStory here. She also married at least four times. I don't have one of her husbands listed in her biography yet. Again, I descend from the first husband, Howard Merkel YORK (1898 - 1945). Ahnentafel #5 - Jane Marie YORK (a.k.a. Jeanne Marie HOLST) (1924 - 2012) - my paternal grandmother, an adoptee. She was born Jane Marie YORK, and her biological mother was Mary Jane BARBER. Her name was changed at adoption. She married Robert Louis ROBBINS (1920 - 2003) in 1940. 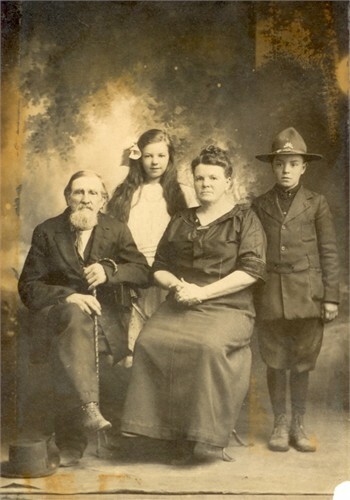 Left to right: Isaac Luke, Leona Mary Martin, Angelia Rebecca (Luke) Martin, Lee Joseph Martin. C. 1915. Unknown location (possibly South Dakota). Original photograph privately held by Karen Coro, [ADDRESS FOR PRIVATE USE], Connecticut. 2013. 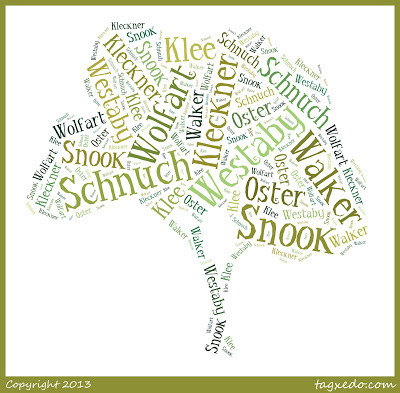 The SNOOK family, originally spelled SCHNUCH, was a German one which joined one of the latter waves of immigration from the Palatinate to the Hudson River Valley in New York State. Over time, the spelling was Anglicized to "Snook". I have been unable to determine the meaning of the name. Ahnentafel #1344 - Johann Theis SCHNUCH (c. 1675 - c. 1714) - Johann was born in Vielbach in the Palatine. On 9 Jul 1708, he married Maria Magdalena OSTER (b. c. 1688) in Germany (probably the Palatine). I do not have death places for him or Maria, so I do not know if they migrated to North America with their children. Ahnentafel #672 - Johannes SCHNUCH - born in Grenzhausen, the Palatine, he married Juliana Catharine Stroder KLEE on 20 Feb1732/3. I have very little information on this couple; however, they must have immigrated to North America, because at least one child was born there. Ahnentafel #336 - William SNOOK (1742 - 1812) - born in either Dutchess County, New York or in New Jersey, he married Elizabeth [?] and had at least one child born in Union County, Pennsylvania. It is believed that his place of death is somewhere in Pennsylvania. 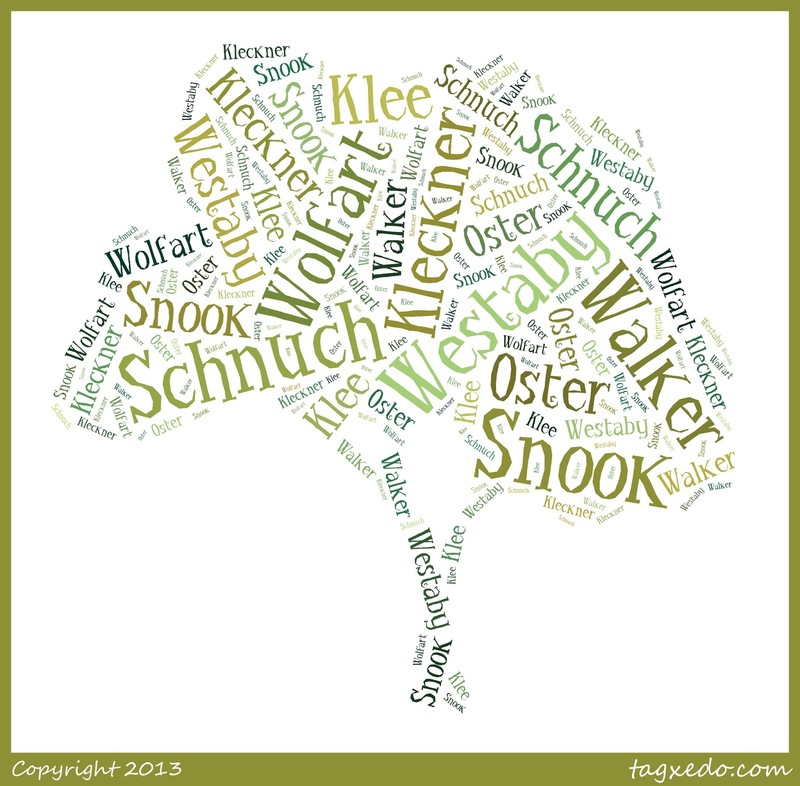 Ahnentafel #168 - Mathias SNOOK (1775 - 1852) - he is the first SNOOK ancestor for which I have any solid information. He was born Union County, Pennsylvania and married Maria Christina KLECKNER there in West Buffalo Township. They had eleven known children and eventually moved to Clinton County, Pennsylvania. It was there, in Loganton, that both Mathias and Maria died. Ahnentafel #84 - Levi SNOOK, Sr. (1807 - 1889) - born in West Buffalo Township, Union County, Pennaylvania. In 1826 he married Margaretha WOLFART (1806 - 1882) in Centre County, Pennsylvania and had at least 10 children; I'm still sorting out possible others besides those listed in his grandson's biography here. Levi and his wife lived their remaining days in Centre County; they died and were buried there. Ahnentafel #42 - Reuben Wolford SNOOK (1833 - 1912) - his biography can be found here, and a photo of him and his second wife appears here. Ahnentafel #21 - Rebecca Catherine SNOOK (1865 - 1960) - her life has been sketched out here.